Kilifi Uele, Tonga Football’s Technical Director has now wearing another hat, FIFA Instructor and to responsible for delivering the FIFA Grassroot coaching course for Tonga in the next five days at the Home of Football, Loto-Tonga Soccer Centre. Uele was a national football player and he became the captain for Tonga side for many years. Then in 2002 he resigned from being a government school teacher and enrolled as a f ootball development officer. He then started to build his pathway, later on he became an assistant coach, head coach, technical director, technical advisor, completed his B License in coaching. In December 2015, he was then approved to participate in the first intake of OFC A License and that will take 18 months before the graduation. 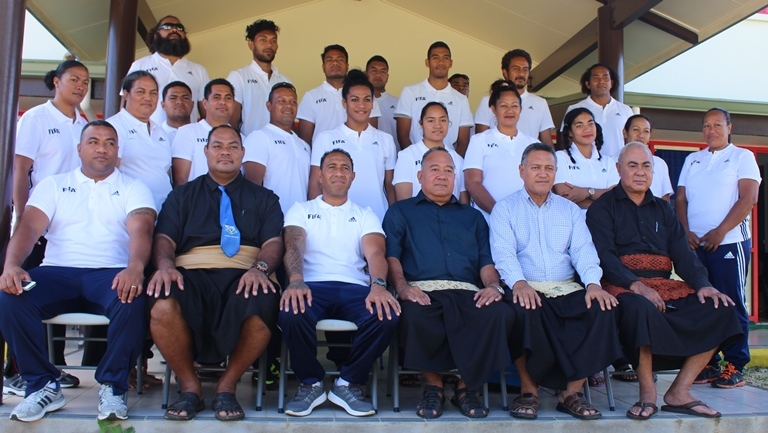 At the moment, he was the Technical Advisor for the Tonga Men’s U 20 that prepared to participate in the coming OFC Men’s U 20 that Tonga will host later on in June 2016. Uele said, ‘’I am so happy that I have been appointed to be a FIFA Instructor and that means I will do as much as I can to pass on the skills and the knowledge I have to those who willing to be a football coach especially to those who have grassroots program. I am confident”. ‘’I am looking forward to this course as I will deliver it all in Tongans, as I noticed in the past, language was sometime an issue when we have overseas instructor,’’ he added. There are 24 participants and they all received each adidas bags with training outfits, adidas soccer boots and adidas slippers. Previous Post Women’s Football takes on to wider horizon! Next PostTonga National U 20 Men’s in their final shape up! Tonga National U 20 Men’s in their final shape up!